Italian artist, designer and architect, Davide Angheleddu, creates bronze and nylon sculptures inspired by the forms of zooplankton, marine microorganisms. X-Ray Mag interviewed the artist to find out more about his artwork, creative process and perspectives on art, technology and the underwater world. After graduating with a degree in architecture from the Politecnico di Milano, Angheleddu specialized in interior design at an architecture studio, where he amassed a great deal of knowledge and experience in 3D digital modeling. He developed the concept of digital representation of not just the end product of a project, but each stage of refinement along the way in the process, starting with the initial idea, or “seed”, from which the ideal shape would develop. This concept formed the basis for his artistic work in sculpture as well. For Angheleddu, the idea that 3D modeling should be a creative tool for visualizing prototypes was important. 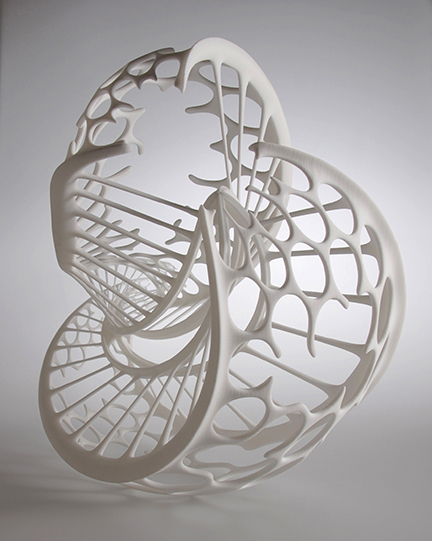 In his work, he employed what he called a “3D software cocktail”, which combined the geometric precision of 3D CAD tools with the more agile yet less precise 3D modeling tools used in animation films, in order to create complex shapes that closely resembled those found in nature. Angheleddu’s artistic method is closely linked with technology. According to the artist, new digital technologies have opened up new frontiers in the field of sculpture. “Nowadays, sculpture can be conceived in a totally virtual environment,” he said, “built by machines using a layer-by-layer principle,” which Angheleddu uses in his artworks. 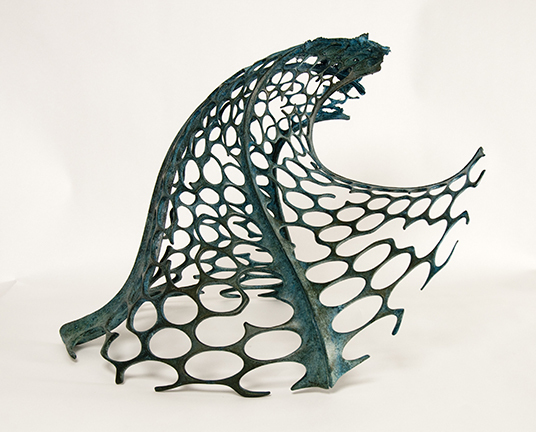 His bronze sculptures are created with two separate processes: laser sintering and lost-wax casting. 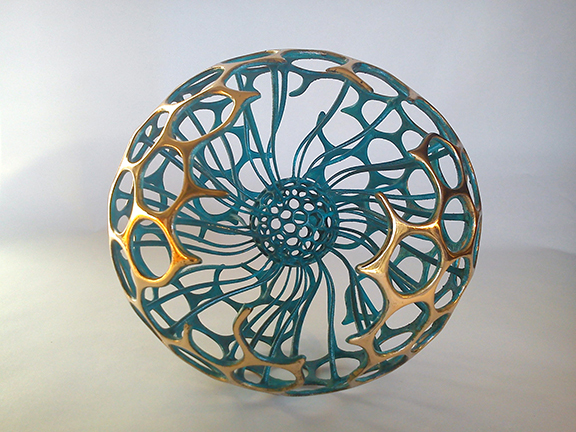 First, a virtual model is cut into layers of .15mm and loaded into a laser sintering machine. With a high-powered laser, nylon powder is solidified layer by layer, creating a physical model of great precision and “potentially unlimited complexity”. 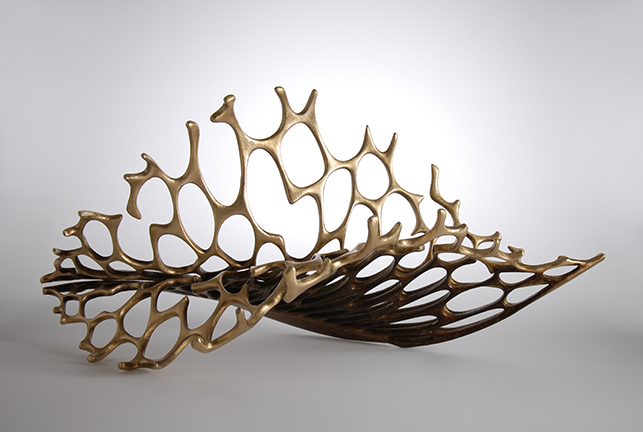 Then, lost-wax casting takes place, which is a method that has remained basically the same over the last 3,000 years. A mold is created in which bronze will be filled to create the final sculpture. This mold is created around the nylon model. The nylon is then heated and evaporated, serving as the “wax” in the lost-wax casting. Then the mold is filled with bronze. Once the bronze has cooled, the sculpture is extracted from the mold. 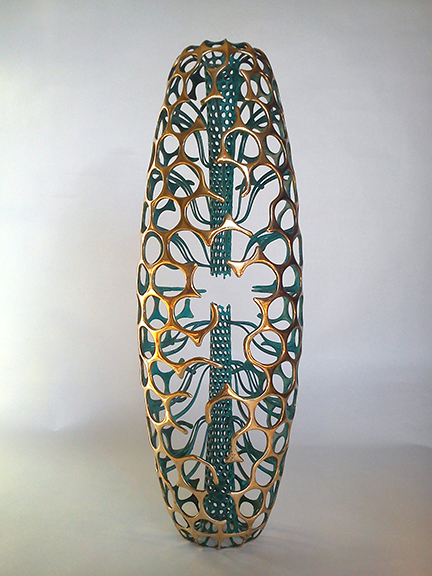 The technology of 3D modeling is essential in the creation of Angheleddu’s sculptures. This technology includes 3D data acquisition, reality-based 3D modeling, 3D time-evolving reconstruction and 3D visualization, which is being used in the field of digital heritage (preserving cultural or natural heritage with digital media). While critical in rendering a project, the technologies often require a dedicated super-computer to construct and visualize models. To simplify this, Angheleddu developed a way to optimize these technologies during his doctoral research, making 3D modeling more widely accessible by using low-cost computers, tablets and smartphones. He turned to the techniques used in the gaming industry to integrate the tradition 3D modeling methods, representing three-dimensional geometries on two-dimensional maps, for example. Although this process was created for digital heritage projects, it was something that could also be applied to complex 3D models. Angheleddu was aware that early on in his doctoral research, the developments in digital heritage would influence his artistic endeavors, as he experimented with new techniques for creating 3D models for sculptures. In creating his artworks, these techniques were reapplied to the raw data of photos. More specifically, he used a re-topology algorithm, used in the first phase of post-processing in large 3D models in digital heritage projects, which he then applied to the 3D points that represented the shape of the acquired object. A smooth surface of the original geometry of the object could then be generated, which became the starting point for the evolution of his sculptures. Angheleddu is an avid scuba diver and snorkeler. His parents are from Sardinia, so every summer he would go there for vacation. “When I was a child, I explored the sea near the reef, and I think that my perception of beauty was influenced by the shape of the underwater world,” he said. 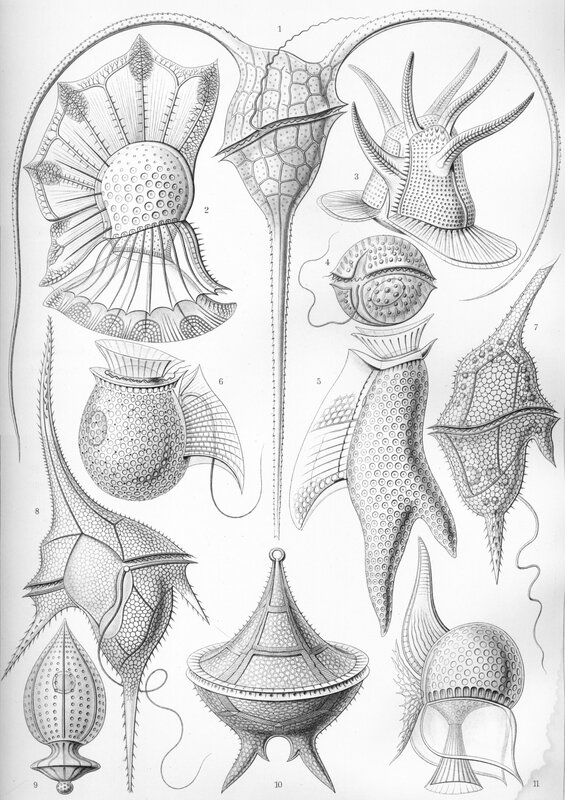 Radiolarians inspired Angheleddu’s first artworks and laid a foundation for following artistic projects. Starting with primary forms, he subjected them to external forces, which destroyed them on one hand, and on the other, gave them new shape and new life. The surfaces of his sculptures are corroded, displaying a worn, green patina. Their initial geometric forms are evident, he said, but then they are ravaged by time. 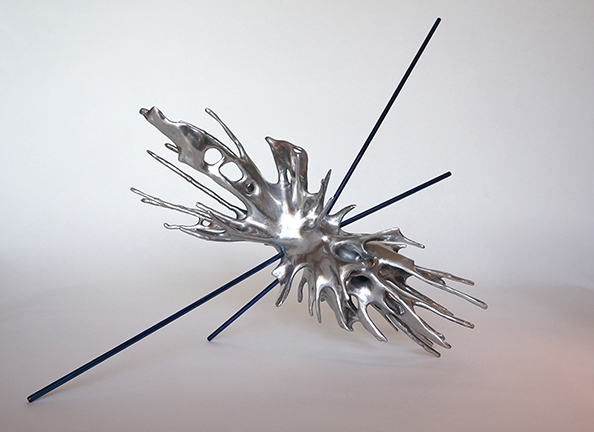 A fragile object results, which the artist likens to human life, which is also continually evolving. Angheleddu said that the most important parts of the objects he makes are the missing ones. Their shapes resemble their skeletons, he said, and one may feel that maybe the true work was a previous form of itself, or a form that it will evolve into later. His artworks represent time passing, and “the continuous becoming of life”, implying the preciousness of every form of life. Angheleddu said that “cooperation” is both the challenge and the benefit of being an artist today. Working primarily on his own a century ago, Einstein was able to develop the theory of relativity and begin a scientific revolution. Today, the world has changed, and researchers need to work in groups to devise experiments and test their theories, said Angheleddu. He thinks that same trend is true for other fields, including art. Interdisciplinary cooperation enriches the final artwork because various points of view can be raised by collaborators in a group. And the interaction of members from different disciplines helps a group find new solutions, because the positive integration of different areas of knowledge helps one see a bigger picture. What was obvious to one discipline might be completely novel and inspirational to another. For more information, visit the artist’s website at: davideangheleddu.weebly.com.